Spring is the time for new things. Did Spring begin at Easter this year? Did it make you think about your faith? If so, what next and where to find out more? I have written before about Alpha and now it is here, whether you read my previous blog or went to the meeting or not. What is Alpha? It is a chance to discover, in an informal setting, what Christians believe – not what atheists told you Christians believed – and what you yourself really believe. Doubt and Faith. This Spring you can discover both. Does Spring start with Alpha or vice versa? It starts in Warrington on Wednesday 1st May at St Ann’s Church WA2 8AJ at 7.00 pm. I’ll be there, and if you let me know if you’re going to join us, I’ll greet you or come incognito if you’d rather. Go to the national website for details about Alpha and to find other places and dates, if you need one nearer you. Is this Spring the time for a new beginning? Not everyone who does Alpha becomes a Christian, but if you don’t you’ll know why not – it won’t be just because you never got round to thinking about it. That could be a new beginning too. Author John MurrayPosted on April 23, 2019 Categories UncategorizedLeave a comment on Easter is over, it must be Spring. What now? Try Alpha! Here’s an invitation to my church for this Easter Sunday. If you live anywhere near Warrington, or perhaps even if you don’t, I’d love to see you at one of these services. Let me know and I’ll greet you there and help you find it if you’ve a problem getting there. The details are on this invitation. Whether or not you take up my invitation, you might like to think about the two-thousand-year-old mystery of Easter. I discussed it in this article I wrote a while ago. As a writer of mysteries, I can find only one satisfactory solution to this one. But what do you think? You might also like to think about the Risk Management in the story. I discuss that in another article. Whatever you decide I wish you a HAPPY EASTER and here’s an Easter greeting from St Paul’s. Author John MurrayPosted on April 16, 2019 Categories UncategorizedLeave a comment on Happy Easter! Here’s an invitation & a mystery for you to ponder. Sin seems to be a part of the Christian message. Some Christians seem to talk about sin more than they talk about God. They sum up the gospel message as ‘Jesus died for our sins’. That is the essence of the message conveyed so very well by the Four Signs and is an important element in the Holy Communion Service. But is that all there is? No. Why have I not mentioned sin in any of my accounts of my journey? I am simply telling it the way I remember it. When I came to faith, I did not have any sense of sin. I was not conscious of that I was afraid of eternal – or even temporary – punishment. If I was afraid of anything, I was afraid of living a lie. The lie that God does not exist. I was looking for truth not forgiveness, or the answer to some personal problem. Sorry to disappoint those who think religion is a mere crutch. It is a crutch, because none of us is whole, but not a mere crutch. Sin was not even the big issue for me when people challenged me as to the reality of my relationship with God. Is sin not important in my understanding of the gospel? It is now. But it is still only part of it. God is bigger than we often think. I became aware of sin about nine months after I had made a decision to follow Jesus. Some friends played a practical joke on me and I took it badly. I really lost it. Although I felt bad afterwards, I was still angry, but I knew it wasn’t right. We all know that love is an essential feature of the Christian life. I was upset and went to see a friend, Kevin, who had been a Christian for a few years and I looked up to him. How did I deal with sin when I first became aware of it? My friend said my anger and bitterness were examples of sin, but Jesus could deal with it. In John’s Gospel, Jesus says he is The Way, the Truth and the Life. Kevin said that Jesus is the Way because he doesn’t just tell us what to do but gives us the way to do it. I had to ask, admit I was wrong and say I wanted to be right. It worked. I don’t know how. God knows. But I was able to forgive the others because I knew God had forgiven me. That was not the first or last time I got angry or did anything wrong. It was the first time I let God deal with it. Do I think sin is an important issue? Yes. Sin prevents you being who God intends you to be and it hurts others. It also hurts God. He wants to deal with it. He can and will. Trust God. However, we don’t all follow the same journey. I became aware of sin only after I had made a decision to become a Christian. For some, it comes first. Don’t copy me or anyone else. Be yourself and let God deal with you in the way that is right for you. Author John MurrayPosted on April 4, 2019 Categories UncategorizedLeave a comment on Did I have to deal with sin on my journey to faith? How can I not be religious? You may think I must be religious, from some of my posts, and from the fact that I have written a book How to Cope with the Church. In fact I’m not. Not really. I don’t like the ceremony or the hierarchy of religion, but I tried being a Christian without going to church and it didn’t work. You need the support of other Christians, and they need you! A preacher preaching. Is that why you’re not religious? Perhaps he’s not either! Does God want us to be religious? On top of that, God wants you to worship him. Of course, you can, and should, do that on your own. Pray, read the Bible, listen to Christian songs. But there’s something important about collective worship. It can take many forms. If you don’t like the first church you go to – if you just don’t fit – try another church. They’re not all the same. It will be worth looking around. Can my book help if you’re not religious? Author John MurrayPosted on March 23, 2019 Categories UncategorizedLeave a comment on Am I religious? The answer might surprise you. I wrote about Ireland some time ago. You might remember this article. Anyway, I hope you read and enjoy it now. And I wish a Happy St Patrick’s Day to all my readers, whether you are Irish, English or anything else. And certainly whether you are a Protestant or a Catholic. Let’s all hope and pray Brexit doesn’t wreck the peace process. Was Alpha the best part of ‘Tell, Serve, Give’ in Warrington this week? What is Alpha doing in Tell, Serve, Give? Alpha is just one of the many events put on this week from the 6th to the 10th March, in Warrington and many other parts of the North West. I wrote about this generally in a previous blog. I hope you’ve found something that was right for you. Then there’s a discussion where everyone gets to saying what he/she thinks about the questions raised in the video and to ask their own questions. Someone leads it, but only to keep everyone on the same question, not to insist on a right answer. The idea is for each person to discover their own answer for themselves. What’s the best bit of Alpha? Food! There’s usually a meal at the start of each session. As each local group is a bit autonomous, I can’t promise what’s going to be on offer this time. If you’re concerned, check beforehand. If Alpha is 10 weeks, how could it fit into a four day event? Simples. What we had on Friday was one-off taster session so you could decide whether you want to do the full version. Even if you decided that it’s not for you, the one-off might have given you something to think about. Or you might have given everyone else something to think about! What if you missed the Alpha event? Or what if you don’t live anywhere near Warrington? There are Alpha courses all over the country. Look at the website. Bring your doubts. They need exploring as much as your faith. Doubt and Faith: Alpha is a way of exploring both. Author John MurrayPosted on March 9, 2019 Categories UncategorizedLeave a comment on Was Alpha the best part of ‘Tell, Serve, Give’ in Warrington this week? Will ‘Tell, Serve, Give’ in Warrington end on Sunday 10th March with bubbles? If you can’t make it, we’ll give you another chance. Of course, some of our churches are visitor-friendly all the time, but a lot of us will be making a special effort on that day. How about you making a special effort to come along? It might not be such a big effort once you decide to come. Author John MurrayPosted on March 5, 2019 Categories UncategorizedLeave a comment on Will ‘Tell, Serve, Give’ in Warrington end on Sunday 10th March with bubbles? Does a fictional or real detective need forensics? Many people now think forensics are the first essential of crime investigation. Of course they are important, but are they always paramount, in real-life or fiction? I write historical fiction under a pseudonym and was discussing a forthcoming novel which I set in prehistoric times. Someone said that was ridiculous, because they didn’t know about fingerprints back then. Well, the police began using fingerprints only in the late 19th century. However, people had been using physical evidence before that. Read the Brother Cadfael stories by Ellis Peters, which she set in the 12th century, or the Matthew Bartholomew stories, by Susanna Gregory, who set it in the 14th century. Of course, as science generally has progressed, so forensic science has moved on too. How can you solve a crime without forensics? A lot of good detectives, in real life and fiction, have relied on questioning suspects and analysing the answers. They catch people out in lies or other contradictions. They apply psychology. (That’s been around since long before Dr Freud). They listened to witnesses. Do my heroes use forensics? In my historical novels, my heroes observe physical details as well as using the other means of detection which I mentioned above. 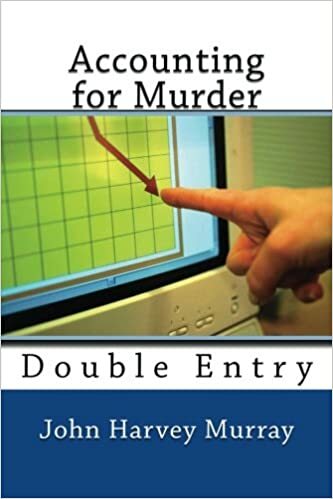 In my modern novels, the Accounting for Murder series, my hero, Frank Hill, is an accountant, and uses his investigative skills, which he learnt in unravelling financial matters, when he is solving murders. Of course, the police are also there and provide the bulk of the forensic evidence, but they form wrong opinions about who-dun-it and Frank has to step in to prevent a miscarriage of justice. I hope you will enjoy following Frank as he follows the trail, tortuous as it usually is, to the solution. By the way, do you have any thoughts about the cover? I mentioned it in a previous blog. Author John MurrayPosted on March 1, 2019 Categories UncategorizedLeave a comment on Does a fictional or real detective need forensics?